The Indian women’s hockey team faced disappointment in their second world cup encounter. 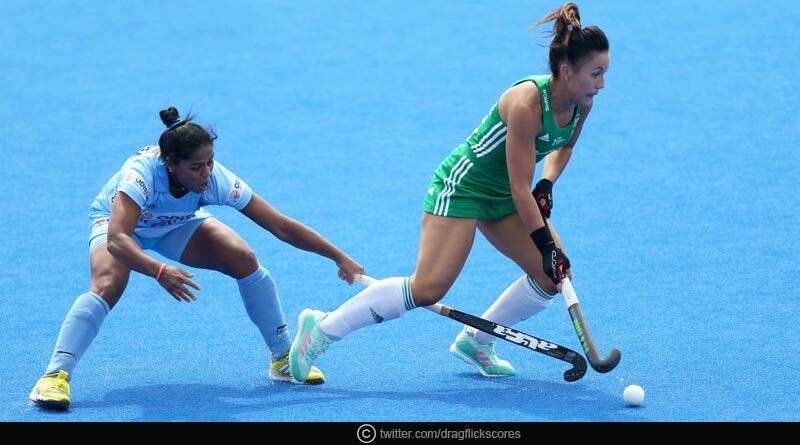 Taking on Ireland in London, the women went down to a solitary goal scored by Ireland meaning their hopes of qualifying for the quarter-finals hang on a hinge. The win for Ireland meanwhile meant that they qualified for the last 8 after having won both their opening games. India will learn their fate of reaching the knock-out phases on the 29th of July in their last Pool B encounter against USA. The only goal of the match came via a penalty corner for Ireland. Ana’O Flanagan converted the set piece for Ireland in the first quarter to ensure the Irish took home the match 1-0. After holding hosts England to a 1-1 draw in their tournament opener, India took on a lower ranked opponent with hopes of sealing their first win and qualifying for the quarterfinals after England and USA had played out a 1-1 draw earlier. It was unfortunately not to be so for the Indian contingent who were unable to get past Ireland’s custodians in defence on the day. With USA and India on 1 point, the next match will be a virtual quarterfinal, deciding who goes through. The second placed team in Pool B will play the third placed team in Pool A in a play-off for a spot in the quarterfinal with the third placed team playing the second placed team in Pool A.
Ayeisha McFerran was a woman inspired. Snatching the victory for her side, we cannot give enough merit to the goalkeeper for her outstanding performance. She made save after crucial save, diving left and right to stop anything that came her. An iron wall on the day, Ireland’s last line of defence proved to be a thorn in India’s quest to find the vital equaliser. Adding to that, Ireland’s disciplined defence defended ferociously with courage to keep the world No.10 side from scoring.